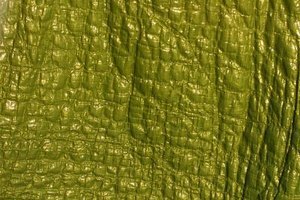 High heat can damage any fabric backing on faux leather. Non-woven plastics like faux leather -- typically crafted from vinyl or polyurethane -- are great mimics of natural fibers. Faux leather is not only easier to sew than natural leather, but it's also cheaper, it doesn't fray, it's available in larger pieces and causes fewer ethical concerns. However, this alternative fabric can also wrinkle terribly. Folded, boxed or hung garments retain creases, and faux-leather furniture, such as couches, wrinkle under seated bodies. Heat is essential when you want to remove wrinkle's from most fabrics -- but faux leather's plastic materials can melt easily and must be dealt with carefully. Place faux-leather garments into the clothing dryer, along with several towels. Run the dryer on medium heat for one minute. If treating furniture, hold a hair dryer several inches from the wrinkle and heat the fabric for one minute. Longer heat-exposure times can damage the faux leather and ruin any adhesive details. Let the faux leather cool for at least two minutes. Hang garments during the cooling period and pass a hand over the wrinkles to smooth them out as much as possible. Do the same with furniture. Heat the garment for an additional 30 seconds, using either a hair dryer or a clothing dryer. Allow a following cooling period for no less than two hours before you repeat. Periodically smooth out the wrinkles by hand. Do the same with furniture, using a hair dryer. Lay faux leather garments atop an ironing board and cover the wrinkled areas with a clean towel. Iron out the wrinkles on a steam-free setting for less than one minute. If possible, iron furniture wrinkles in a similar manner. Smooth out wrinkles by hand as the faux leather cools. Let the leather cool for at least two minutes before further use. Wooden hangers cause fewer wrinkles in faux-leather garments than do wire hangers. Roll and store faux-leather sewing fabric in a cardboard tube to prevent wrinkling. Some creases may be permanent and will never come out, even with heat treatment. Avoid leaving faux leather folded or crushed for too long. Faux Leather Guide.Com: How to Get Wrinkles Out of Faux Leather? Can You Iron Tuxedo Pants?